This Basic Table Cover Kit has everything you need to cover your table Save $11.98. The new kit provides an incredibly comfortable and warm surface upon which to receive massage treatment. The Thermal Cotton Blanket and Flannel Sheets hold body heat in for your clients and they fit most table tops. Deluxe Sheet Set Flannel Natural - There is nothing like soft cotton flannel sheets to make for a great massage experience and these cotton flannel sets are designed for comfort, fit, and extended use. These soft 100% cotton blushed flannel sets offer an increased size on all pieces. 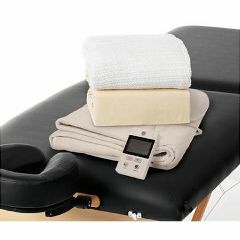 The additional depth, width, and length will fit any massage table we know of, even with the use of a thick fleece pad. The face rest cover design has also been modified to allow for the extra thickness of a fleece face rest pad. The sheets have a 170 thread count Soft, double-brushed medium-weight flannel is appropriate in summer as well as winter and withstands repeated rough washings. The generously oversized fitted and flat fit tables up to 33 inches wide. You and your clients will appreciate the oversized flat sheet that measures a full 55-inches wide allowing plenty of coverage during massage including those prone to supine transitions. Digital Massage Table Warmer - A great addition to your portable or stationary massage table, this is a full sized Body table Warmer that provides safe, even warmth from one end of the table to the other. We all know that effective bodywork needs to begin with a relaxed warm body, and a few minutes resting comfortably on the Body table Warmer helps your client disconnect from the world. Elastic bands hold it securely to your table to avoid slipping. The new digitally adjustable heat settings allow you to customize the heat for client comfort. Also, for your convenience, the cord is 9-feet long. During those cool seasons this feels incredibly warm, snuggly and comforting is what your clients will love. Thermal Cotton Blanket - When you need a little more warmth for your client, this cotton thermal blanket is a great addition. The blanket adds warmth to ensure a comfort and relaxation before, during, and after use. At 66" x 96" this thermal blanket is big enough for many different situations.